DID YOU KNOW that when America was born, the Irish were there? The Irish, both Protestant, and Catholic, were a major part of Washington’s volunteers from foot soldiers to high ranking officers. When increased Crown exploitation drove the colonists to protest, among the loudest were the Irish who had no great love for the Crown, to begin with. And there were many Irish in America’s colonies. Among them were those who fought the English theft of their Irish lands and ended up hunted men; they were followed by those Catholics and Presbyterians who fled persecution by the Church of England. Some were businessmen who had to escape the economic oppression fostered on them by the Crown in order to benefit their British competitors. Some altered their names like the ancestor of John Hancock who came from Co Down, and like Capt. Daniel Patrick and Robert Feake – first white settlers in what is now Greenwich, CT. They also settled in New Hampshire, where they founded the town of Concord; in Vermont, where their sons would lend strength to the Green Mountain Boys led by Irish-American John Stark and Limerick-born Matt Lyons; in New Hampshire where Capt. Maginnis commanded the militia; and other areas from Maine, home of the O’Briens who would capture the 1st British ship in the coming war, to Pennsylvania, founded by William Penn who had grown up in Co Cork. Philadelphia had a Hibernian Club as early as 1729; it later became the Friendly Sons of St Patrick, whose first President was none other than Stephen Moylan of Co Cork – soon to be one of Washington’s top Generals. In just 1772 and 1773, more than 18,500 Irish arrived and they were no friends of British colonialism. When protest began about Crown usurpation of civil liberties the Irish were prominent. Among those killed in the Boston Massacre in 1770 was Irish-born Patrick Carr; Boston Tea Party participants met at an inn owned by a man named Duggan; and the tea was dumped at Griffin’s Wharf by a group dressed as Indians, some of whom had a notably Irish accent. 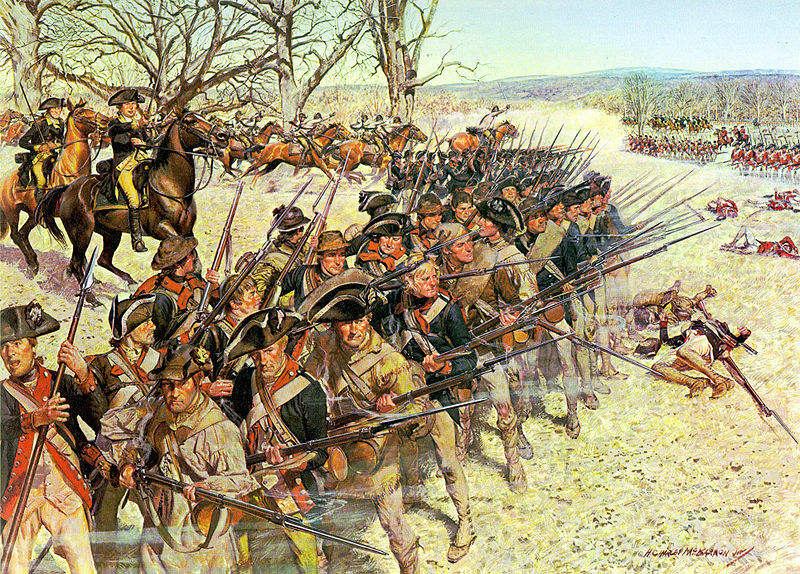 While young Irishmen rushed to arms in support of Washington, Irish merchants participated in the deliberations of Councils and in Congress, raised money to feed and clothe the army and advance the credit of the new government. Irish-born Oliver Pollack personally raised over $300,000 which would be more than $8 million today. On July 1, 1776, after a full year of hostilities, a resolution was presented to break with England and approval of the final draft of a document was made on the 4th. The Philadelphia State House was packed as Secretary Charles Thomson of Co. Derry read the document explaining why their action was justified. After a full day of modifying copy, Secretary Thomson recorded the changes, and America’s Declaration of Independence was complete. Among the signers were 6 Irish-Americans and 3 native Irish including James Smith, Matthew Thornton and George Taylor who was also a Colonel in his local militia but, sadly, he died while still a delegate to the Continental Congress. On July 8, the people first heard that historic document read by Col. John Nixon, son of an Irish immigrant from Wexford; it had been printed at great personal risk by Charles Dunlap of Co Tyrone. There would be many more years of struggle before the last battle was fought on March 10, 1783, but America had made her stand. The last battle, by the way, saw Irish-born John Barry defeat the British ship Sybil. He’d been carrying a cargo of gold with which Congress would establish the new Bank of North America with the help of Irish-born Thomas Fitzsimons. During the whole of the war, the English and Scots were treated with distrust even with the best of attachment for the cause, but the native of Ireland stood in need of no other certificate than his accent. While the Irish emigrant was fighting for America on land and sea, Irish merchant’s purses were always open and their persons devoted to the country’s cause, and on more than one imminent occasion Congress itself, and the very existence of America, owed its preservation to the fidelity and firmness of the Irish. Even President Washington wrote that the Irish need that critical moment to shake off the badges of slavery they have worn for so long. These are just a few examples of the Irish and Irish-Americans who made America great!